Catch up | Two cultures, one mind. A little bit of catching up in the blog today. On Tuesday evening I went to a BCS talk at the tic (sometimes seen as rivals to ‘my’ Department of Computing) for a talk about Radio-Frequency identification tags (RFID). This was really interesting.. It must have been as I rather cheekily asked some questions, something I very rarely do at these kind of things. It was good to be there with Simon, who was interested in RFID from a commercial viewpoint. For myself I was interested because despite having supervised an MSc student last year, and setting an undergraduate project on the subject this year, I really had only the most cursory knowledge. Having been to two very interesting meetings, I’ve decided I should renew my BCS membership, even though I have to pay for it myself as I think it could be a real advantage.. And more than just having four more letters after my name. And yesterday I was London bound for a placement visit, which I’m pleased to say went very well. The student gave a presentation in a very intimidating lecture theatre, and apart from some typing errors on the slides, gave a good show of herself and the company. I really hope that they take another placement student next year, and that the student is allocated to me. 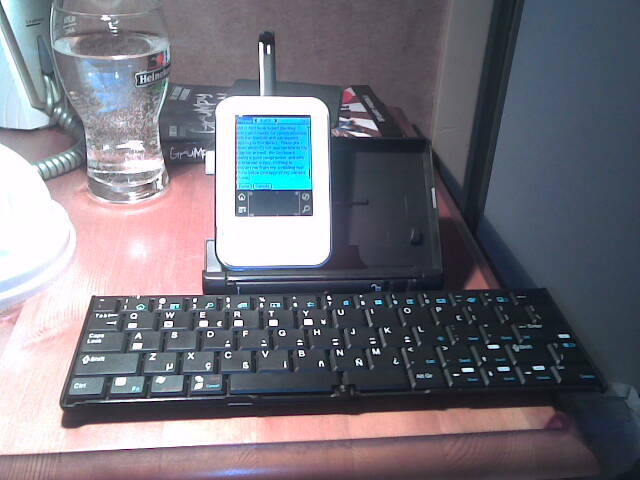 Finally, another gadget to add to my armoury arrived yesterday – a wireless keyboard for my Palm Z22 PDA. I’m really impressed with it, and in fact have typed this blog entry on it ready for synchronisation with my Outlook and subsequent copying to WordPress. There are times when it’s not appropriate to lug a laptop around, this keyboard seems a good compromise, and with no Internet access, nothing to distract me from my scribbling too! Photo below courtesy of my camera phone.